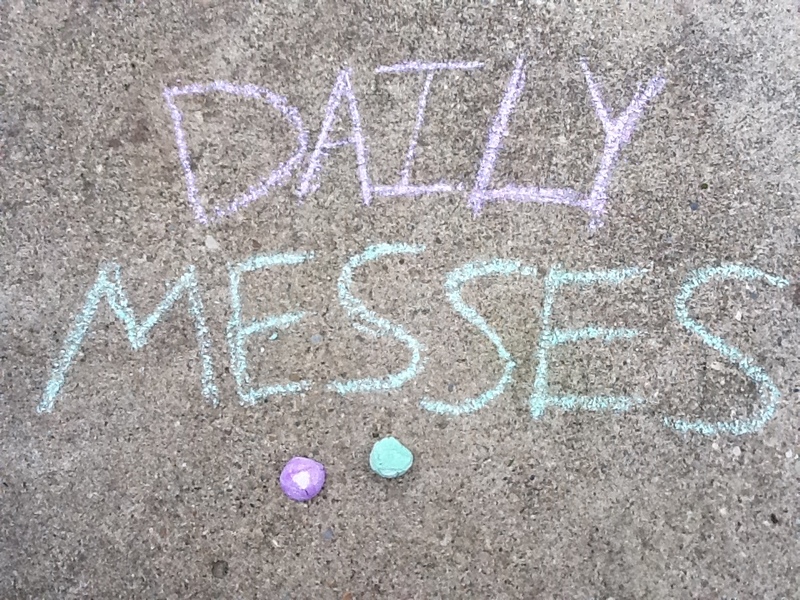 Daily Messes: It's Getting Warmer! It's slowly getting warmer, although I swear I saw a snowflake this morning. I love when it gets warm and the kids can play outside more often. 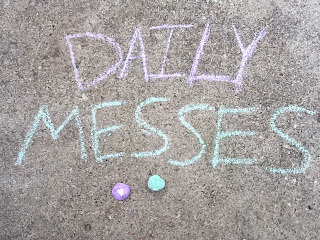 I love having bubbles and chalk on hand. They are fun to play with and you can make all kinds of things with the chalk (roads for cars, obstacle courses, hopscotch, practice spelling words, etc.). We have even made our own! It's easy to do. 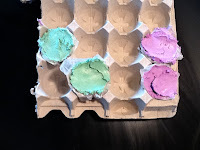 In a bowl, combine 1 cup Plaster of Paris with 2 Tbsp paint. Mix with craft stick. Slowly mix in water until it is thick and pasty. Pour into paper cups. Let dry for several hours. Once mixture is completely dry, peel off the paper cups. *Note: I forgot to buy the paper cups. Instead, I used egg cartons for my mold and lined them with wax paper before filling. I let them dry about 24 hours, removed the chalk from the mold/wax paper and let dry overnight again to make sure it was completely dry. I had about 1 cup Plaster of Paris mixed with 1 cup water. I used Crayola Washable Paints. You might also like my Chalk Board Table post, where I sanded and painted the top of an old school desk with chalkboard paint. You could also paint random items for the kids to draw on. One year, we painted a pumpkin in chalkboard paint so they could draw different faces on!